This is a great warm up activity for the younger players (U12 and younger). Depending on the amount of players you can set the bouldaries for this game to be played in half ice, inside the blue line at one end, or in the neutral zone. 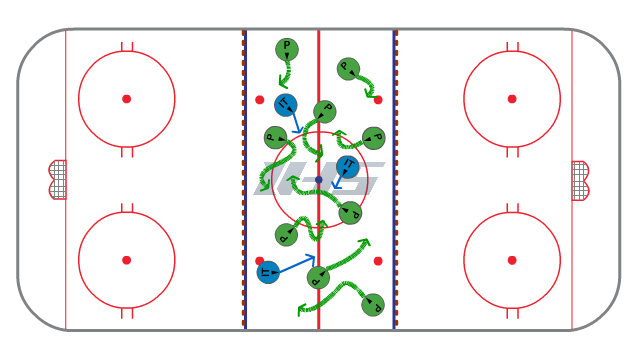 This game will help players develop awareness while maintaining control of the puck. It will require them to have their head up and find players that are "frozen". In this game every player will have a puck. The coach will define a boundary based on the amount of players in the game. At the start of the game you must identify 3 players or coaches to be “IT”. On the whistle the players will skate within the boundary while controlling the puck. The players (or coaches) that are “IT” try to tag as many players as they can by touching them. When a player is touched they must stand with one hand on their stick, feet apart, and the other hand up in the air like they are raising their hand. In order to get back in the game another player must attack their triangle by stickhandling through their legs or the space between their feet and stick. Play for about 3 minutes or until all of the players have been tagged and are standing still. This drill also works on basic fundamentals of the forehand shot. The players will collect the puck at about the top of the circle on their forehand. As they continue around the pad they will keep the puck on their forehand and take a shot once they are clear of the pad. 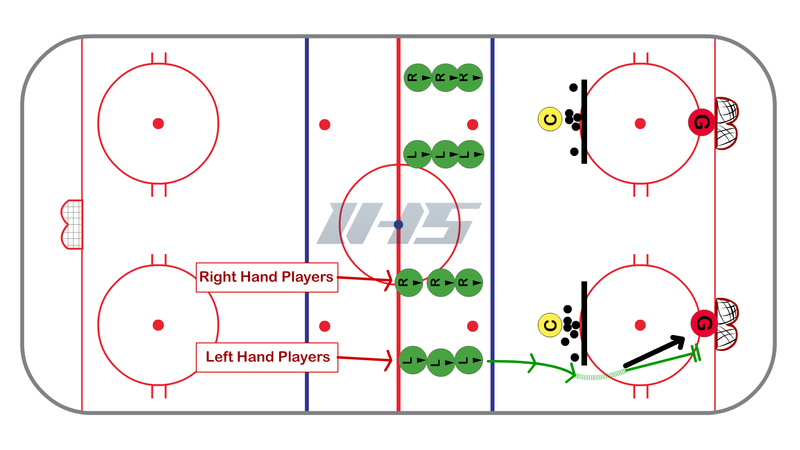 Set up the drill with the left handed players in line to the goalie's left and the right handed players to the goalie's right. The coach will start the drill by placing a puck at the top of the circle. Take turns alternating lines and make sure the goalie has enough time to recover. keep the puck in shooting position as you go around the pad. keep puck back in stance as mush as possible. use good weight transfer, weight should be on foot closet to the goal after the shot. use inside edges as you collect the puck and skate around the pad. 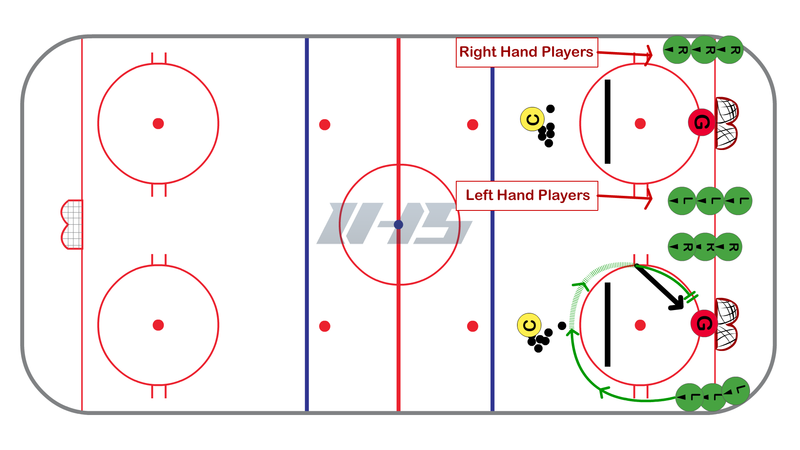 This progression of the forehand fundamentals series has players surrounding the puck from their off-hand side. It is a bit more difficult for younger / novice players but a good one to work on. 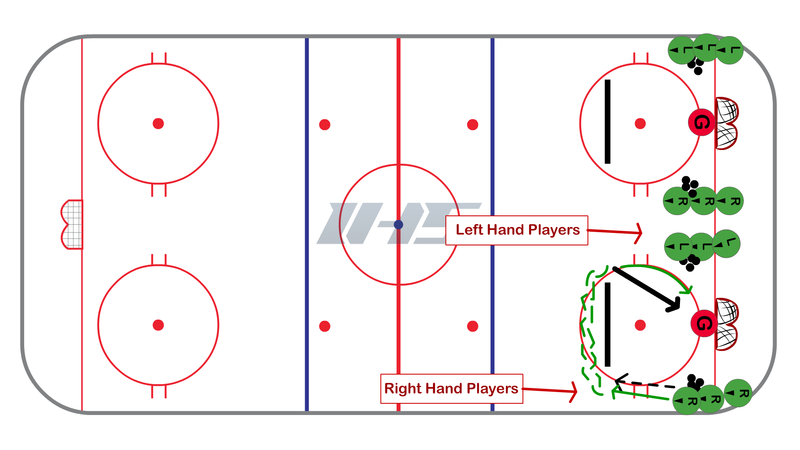 To set up the drill place the left handed players in line to the goalie's right and the right handed players to the goalie's left. Players will carry the puck around the pad keeping the puck on their forehand. They will surround the puck as they go around the pad. As they get to far side of the pad they should have the puck in shooting position. 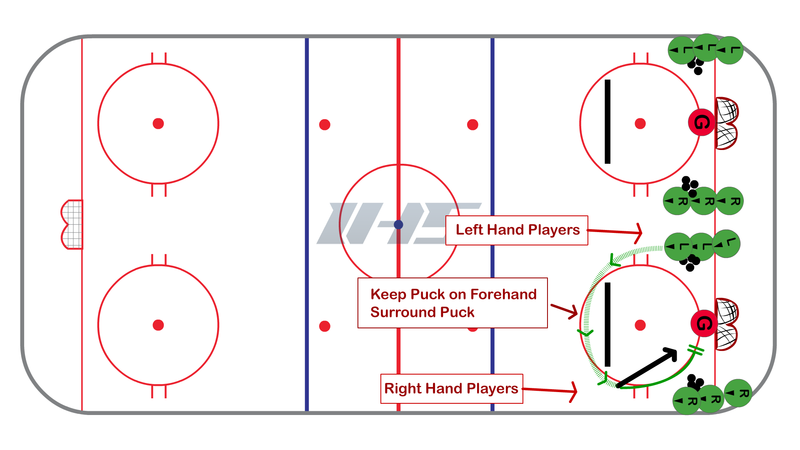 keep puck on forehand as you skate around pad. puck should be off the back foot as you start the shot. keep head over the puck. weight should be going towards goalie after shot.